All - just a quick note to let you know that there's a new article for the month of June. Chris has kindly included a writeup I did on the Chroma Pressure Interface. (P.S. - If I don't reply to anyone's e-mail for a little while, it is not because I'm ignorning you ... I'll be out of e-mail touch for a week or two). I'm currently servicing a pal's Chroma. It had some power Supply issues when I got it a year ago but seems to have come alive after all. If I power it up with all the voice cards removed, it boots up alright. All the functions seems to work. But when I start to insert voice cards it hangs up. With all cards inserted it flashes for a while then tries to load the most recent patch only to start booting up again. Finally, after having tried to boot up two or three times it displays an E in the parameter display. I've also managed ro single out two voice cards that doesn't seem to cause the CPU to hang. Although I don't get any sound from them. I've been searching the archives for an answer but cannot seem to find any hints as to what can be the source for this problem. Any helpers out there ? I'm currently servicing a pal's Chroma. ... If I power it up with all the voice cards removed, it boots up a alright. All the functions seems to work. But when I start to insert voice cards it hangs up. With all cards inserted it flashes for a while then tries to load the most recent patch only to start booting up again. Finally, after having tried to boot up two or three times it displays an E in the parameter display. There's no normal mode of operation in which the Chroma will automatically 'reboot' itself it the last boot failed - so if you see it restarting the tune sequence (by itself), it either means that the CPU has become confused or - more likely - the reset signal to the processor has been asserted low. I would watch to see what the PSU's reset signal is doing during the boot sequence. It should only be asserted once. It could be that adding in the additional voice cards causes a drain on the PSU, causing the reset signal to drop out. The other basic check would be to ensure that when the voice boards are installed that the voltages from the power supply are all OK.
SET SPLIT 31 is invaluable in cases like these. It will force the boards to be tuned with nominal values, and then ensure that they're all still 'playable.' This will make it easy to trace the signal through the voice-board to see where it is getting lost (or what is preventing that voice from being heard). So to fix which card or slot is wrong or not ...try much combination you can. Also check circuitry inside Channel M/B , I/O M/B and Computer M/B to verify eventual wrong components or dirty connections . my name is Peter-Jan Kleevens. I live in Holland. In 1984 I bought my Rhodes Chroma (not the Polaris but the real thing). I still have it and still love it. I used to take it with me on the road and stage for years, but now I keep it in the studio. The problem is that over the years more and more oscilatorboards are being shut off by the internal processor, and I don't what to do about it. Is there anybody out there who can give me some advise. I think I can help you on this one. I also live in the Netherlands and have succesfully repaired my bad boards over the years, I am an electronic engineer and I think I can fix the boards for you. Otherwise you can try to call Huub Rohde in Alkmaar. He used to work for Dirk Witte in Amsterdam and was the official service engineer for the Chroma. I advise you to send me an email if you need more info. David Clarke provided some information on [SET SPLIT] commands 31-35. I've added these to the PDF version of the Chroma Parameter Chart and posted Dave's notes. 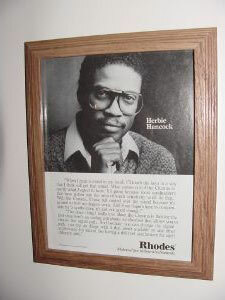 Perhaps the most unusual Chroma-related item I have ever seen (and I've seen quite a few), there is a framed copy of Herbie Hancock's endorsement of the Chroma, for auction on eBay. "Excellent condition, original 1983 promotional ad for Rhodes Chroma synthesizers. Ad pictures Herbie Hancock and reads, 'What comes out of the Chroma is exactly what I want to hear.' Ready to hang in a mounted and glassed 8 1/2 X 11" solid wood frame." Curiously, another framed copy of the same ad was for sale on eBay a few years later: see Framed Hancock Ad on eBay, February 2006. Kenton has informed their US dealer that as of December 31, they will cease production of all MIDI retrofit kits. Seemingly of small immediate impact to the Chroma community; however, once Ken Ypparila  runs out of Syntech/Chroma Cult boxes and the Kenton is unavailable, there aren't many options left. MIDI Retrofits lists kits from EES Technik für Musik, Jellinghaus, and Rogue Music. I received an e-mail from EES a few years back. Ernst Eimer  made me aware of this retrofit; I also received a short description from Benjamin Fehr, which I added to the site today. If this kit is still available, I wonder if the sysex format would be compatible with that produced by the Syntech. Not likely, I suppose. I e-mailed Jellinghaus in '99 but didn't receive a reply. Likewise with Rogue Music, though I suspect they are/were just offering the Syntech or Kenton kit. Moral of the story: if you don't have a MIDI retrofit yet, want one, and have been putting it off, I'd suggest contacting Ken.